Now that the MarCOs — a pair of briefcase-sized interplanetary CubeSats — seem to have reached their limit far beyond Mars, we’re looking forward to an expanding era of small, versatile and powerful space-based science machines. The MarCOs — nicknamed EVE and WALL-E, after characters from a Pixar film — served as communications relays during InSight's November 2018 Mars landing, beaming back data at each stage of its descent to the Martian surface in near-real time, along with InSight's first image. CubeSats were pioneered by California Polytechnic State University in 1999 and quickly became popular tools for students seeking to learn all aspects of spacecraft design and development. Today, they are opening up space research to public and private entities like never before. With off-the-shelf parts and a compact size that allows them to hitch a ride with other missions — they can, for example, be ejected from the International Space Station, up to six at a time — CubeSats have slashed the cost of satellite development, opening up doors to test new instruments as well as to create constellations of satellites working together. CubeSats can be flown in swarms, capturing simultaneous, multipoint measurements with identical instruments across a large area. Sampling entire physical systems in this way would drive forward our ability to understand the space environment around us, in the same way multiple weather sensors help us understand global weather systems. Ready to get started? Check out NASA’s CubeSats 101 Guide. The size and cost of spacecraft vary depending on the application; some are the size of a pint of ice cream while others, like the Hubble Space Telescope, are as big as a school bus. Small spacecraft (SmallSats) generally have a mass less than 400 pounds (180 kilograms) and are about the size of a large kitchen fridge. CubeSats are a class of nanosatellites that use a standard size and form factor. The standard CubeSat size uses a "one unit" or "1U" measuring 10x10x10 centimeters (or about 4x4x4 inches) and is extendable to larger sizes: 1.5, 2, 3, 6, and even 12U. 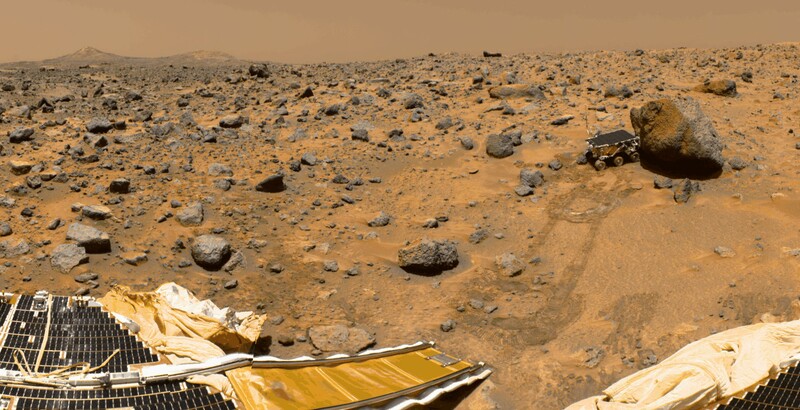 The Sojourner rover (seen here on Mars in 1997) is an example of small technology that pioneered bigger things. Generations of larger rovers are being built on its success. Not unlike a CubeSat, NASA’s first spacecraft — Explorer 1 — was a small, rudimentary machine. It launched in 1958 and made the first discovery in outer space, the Van Allen radiation belts that surround Earth. It was the birth of the U.S. space program. In 1997, a mini-rover named Sojourner rolled onto Mars, a trial run for more advanced rovers such as NASA's Spirit, Opportunity and Curiosity. Innovation often begins with pathfinder technology, said Jakob Van Zyl, director of the Solar System Exploration Directorate at NASA's Jet Propulsion Laboratory. Once engineers prove something can be done, science missions follow. "When it comes to innovation, MarCO is in the same class as Explorer 1 and Sojourner," Van Zyl said. "The question is: Can we use CubeSats to do more science? Not all science, because they're too limited to carry many instruments. But this technology creates a vehicle for people to do science at a much lower investment to the taxpayer." NASA is continually developing new technologies — technologies that are smaller than ever before, components that could improve our measurements, on-board data processing systems that streamline data retrievals, or new methods for gathering observations. Each new technology is thoroughly tested in a lab, sometimes on aircraft, or even at remote sites across the world. But the space environment is different than Earth. To know how something is going to operate in space, testing in space is the best option. Sending something unproven to orbit has traditionally been a risky endeavor, but CubeSats have helped to change that. The diminutive satellites typically take less than two years to build. CubeSats are often a secondary payload on many rocket launches, greatly reducing cost. These hitchhikers can be deployed from a rocket or sent to the International Space Station and deployed from orbit. Because of their quick development time and easy access to space, CubeSats have become the perfect platform for demonstrating how a new technological advancement will perform in orbit. RainCube, a satellite no bigger than a suitcase, is a prototype for a possible fleet of similar CubeSats that could one day help monitor severe storms, lead to improving the accuracy of weather forecasts and track climate change over time. IceCube tested instruments for their ability to make space-based measurements of the small, frozen crystals that make up ice clouds. Like other clouds, ice clouds affect Earth’s energy budget by either reflecting or absorbing the Sun’s energy and by affecting the emission of heat from Earth into space. Thus, ice clouds are key variables in weather and climate models. A series of new CubeSats is now in space, conducting a variety of scientific investigations and technology demonstrations following a Dec. 17, 2018 launch from New Zealand — the first time CubeSats have launched for NASA on a rocket designed specifically for small payloads. CubeSat technology is still in its infancy, with mission success rates hovering near 50 percent. So, a team of scientists and engineers set out on a quest. Their goal? To build a more resilient CubeSat — one that could handle the inevitable mishaps that bedevil any spacecraft, without going kaput. They wanted a little CubeSat that could. They got to work in 2014 and, after three years of development, Dellingr was ready to take flight. CUVE would travel to Venus to investigate a longstanding mystery about the planet’s atmosphere using ultraviolet-sensitive instruments and a novel, carbon-nanotube light-gathering mirror. Lunar Flashlight would use a laser to search for water ice in permanently shadowed craters on the south pole of Earth’s Moon. Near-Earth Asteroid Scout, a SmallSat, would use a solar sail to propel it to do science on asteroids that pass close to Earth. All three spacecraft would hitch rides to space with other missions, a key advantage of these compact science machines. "There's big potential in these small packages," said John Baker, the MarCO program manager at JPL. "CubeSats — part of a larger group of spacecraft called SmallSats — are a new platform for space exploration affordable to more than just government agencies." Follow along. Visit NASA’s CubeSats Portal for the latest news.